Thanks to iOS 5, anyone with an iOS device can now easily keep in touch—for free!—by using Apple’s new iMessage service, found within the Messages app. iMessage works without any per-message charges from cellular providers or monthly texting plans; instead, you’ll send messages over your device’s 3G or Wi-Fi connection. iMessage is easy to set up and use: All you need is an Apple ID, and you can start messaging your fellow iOS device users. From the Messages Settings screen, you can turn on the iMessage feature, as well as indicate whether you want others to see when you’ve read their message or allow the app to send your message as an SMS if your iMessage can’t get through. To start using iMessage, open the Settings app and tap the Messages menu. You’re prompted to enter your Apple ID—that’s the email address you use for buying apps in iTunes and logging in to iCloud. If you don’t have one, you’ll be prompted to create an account. Other settings let you choose the email address or addresses you’d like people to be able to reach you at. (You can associate multiple addresses.) There’s also an SMS/MMS section, which allows you to enable or disable MMS Messaging (iPhone only), Group MMS Messaging (iPhone only), Show Subject Field, and Character Count (iPhone only). That blue chat bubble next to a person’s name signifies that a contact is iMessage-enabled. To start writing a new message in iMessage, tap the new message icon in the upper right corner. In the To field, type the email address or iPhone mobile number of the person you want to message. If you’ve never tried to send a message to this person before, the app will automatically spot-check the address when you finish typing, to ensure that it is iMessage-enabled. If it is, you’ll see the email address, phone number, or (if the address is in your contacts) person’s name light up in a blue bubble, acknowledging that you can go ahead and compose your message. In the future, when you type that person’s name or email address, you’ll see a little blue chat bubble next to it in the drop-down menu, signifying that this contact is iMessage-enabled. Type in an address or phone number that doesn’t belong to an iOS device when using iMessage on an iPad, and the name will light up in red. You won’t be able to send anything. If you’ve typed in an address or phone number that does not correspond with an iOS device, one of two things will happen, depending on which iOS device you’re using. 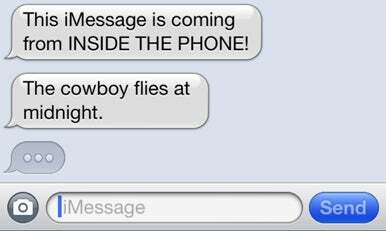 If you’re on an iPhone, your outgoing message will change into an SMS (or, if you’re messaging a group, a Group MMS), and your contact’s name will highlight in green. 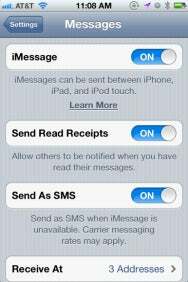 If you’re using one of Apple’s other iOS devices—an iPod touch or an iPad—your contact’s name will light up in red with an exclamation point next to it, and you won’t be able to send anything. When you get into a conversation with someone on an iPhone, you’ll be able to tell whether it’s an SMS/MMS or iMessage conversation by the color of your chat bubbles; green for SMS, blue for iMessage. On other iOS devices, the chat bubbles will stay a lovely shade of blue at all times. Like MMS messages, you can send text, photos, video, contact cards, and map locations to a fellow iMessage contact. You can also carry on chats with a group—though be aware that you’ll need all your group members to use iOS devices; otherwise, you’ll fall back to an MMS message (on an iPhone), or the chat will fail. As your friend types out an iMessage, you’ll see a gray thinking bubble. iMessage offers a few neat extras for users: If you enable the Read Receipts feature, your contacts will be able to see when you’ve read their messages; and if you’re carrying on a lengthy conversation, you’ll be able to see when your friend is typing, and vice versa, thanks to a gray “thinking” bubble. The iMessage app also offers a bit of animation: If you want to consult a point earlier in the conversation but you have the keyboard open, you can just scroll upward; the keyboard will intelligently slide down into the bottom of the screen. Because iMessage uses 3G and Wi-Fi to transmit its messages, it’s occasionally not the most reliable to use on an iPhone in the case of a natural disaster or 3G outage. This is where the Send As SMS toggle comes into play: If you have this option enabled, you’ll be prompted to send your message as a traditional SMS instead in the event that the iMessage app can’t transmit something over a data network.